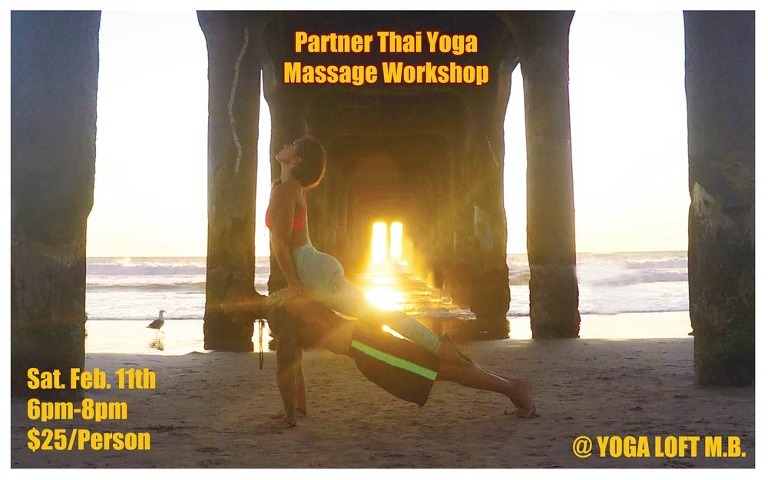 Come join us at The Yoga Loft Manhattan Beach to celebrate Valentine’s Day with a special Partner Thai Massage workshop led by Amanda Murphy and Rian Basilio. In this intimate and informative workshop, attendees will get a brief overview of the theory and techniques used in this sacred healing practice; followed by 1.5 hours of guided massage in which you and your partner will take turns massaging each other. During the massage, Amanda will walk you through each step teaching you how to apply these age-old techniques, expanding a very intimate, physical and spiritual connection between you and your partner. Along with the massage techniques, Amanda and Rian will demonstrate some very yummy Acro Yoga partner stretches that you will be able to take home and incorporate into your personal practice. We look forward to sharing this amazing evening with you all.